Do you own a TomTom Rider? If so you are probably disappointed; however, folks at TomTom have made it clear that the new TomTom Rider will not be fading into darkness. With the realizing of how bad was the feedback of the old device. TomTom will try their luck with the same name in 2013, only a brand new set of specifications and features. It looks like TomTom listened to customers feedback and decided to give one more try with TomTom Rider. The device is made so that it sits on and allows you to get guided in real time, find local hotspots, and share routes with bikers via Bluetooth. The new updated TomTom Rider allows for using Bluetooth to listen for directions inside your helmet. All you need is a Bluetooth friendly ear buds. The new charging bike dock turns the device on and off with the ignition. TomTom Rider will feature a improved display for better clicking and better visibility in the sun. Another interesting feature is that the screen is 4.3-inch and it is touch friendly, and biker glove friendly. Which is great, there will be no more taking off motorcycle gloves for changing directions. The rumors are that TomTom decided to do another version of Rider from most of the bad reviews that the first generation of Rider received. TomTom has stated that their main source for improving the GPS system was motorcycle communities. Another major add on to TomTom Rider is allowing for a biker to find and ride the best scenic routes in the world. With a complete software for your PC, or MAC you will be able to create routes or interest points and load them up to the GPS for the road. The device is able to be used in all types of weather, without you worrying that it might rain on the device. Including Free Lifetime Maps forever. I hope we have changed your mind about the old TomTom Rider and that you will try out the new beast TomTom Rider as soon as it comes out. Make sure to watch the new video for TomTom Rider, I have to admit they done a great job with presenting TomTom Rider. What is the difference between a good ride and a horrible ride? Well a good ride is when you don’t stress you will get lost, or need fuel. A bad ride is when you worry that you have to stop for fuel, or memorize the map. Don’t get me wrong every biker likes to remember the street names, and if he or she forgets them, they still enjoy the ride without worry’s. But allow me to introduce you to our new item, which makes my life easier. I have a Smartphone, which is making my life so much better, now I never have the spot to put my phone on the motorcycle, so usually it is in the pocket. My point is why bother with gps, when I have a gps in my phone and same goes for mp3 player. Our good friend Biker Monkey has written about going high tech, and I do recommend checking out his post, and analyzing both posts. The best quality of this phone, gps, and e-zpass holder is the protection for your devices. It has a lot of room to fit your phone, gps or e-zpass. It can be used at long rides, you can tighten the grip of the holder. When leaving your motorcycle remember to take your electronics with you! Motorcycle helmets are the biggest essentials in our daily rides. Have you noticed that some motorcycle helmets have changed quite a bit? For example, some became more popular than others, some have better designs, and some added Bluetooth technology. However, they all have in common the same purpose to protect us while accidents happen. Now recently they have been working on bringing in a technical innovation to helmets. They are working on high and low impacts keys with gel type material between two plates. Which is supposed to be better protection for your head. 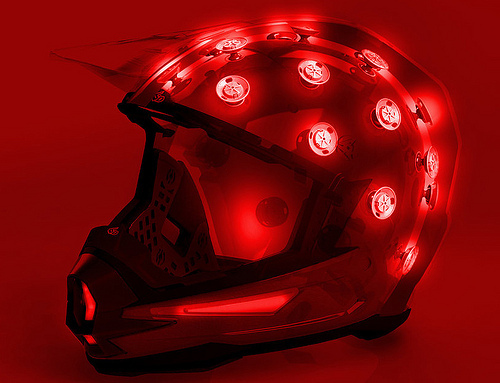 Maybe when this innovation will be introduced we will be able to ride and not worry about any head damage. Remember our old post about Christmas gifts and suggestions for what to buy your loved ones? If not, you can recap it here, however we have added few changes to our list. To make it easier for you to shop we have separated our list into categories. For your convenience we have taken out Trending @ eBikerLeather from our navigation and added Christmas Gifts Ideas. Click on each category to browse our selection of motorcycle apparel and accessories.